Big changes are coming in the grocery store aisles, in particular to the Nutrition Facts label. The new label (image below) will need to be implemented by manufactures in July of 2018 with the exception of those with less then $10 million in annual food sales who have been given an additional year to comply. At first glance, it doesn’t seem like there is that many changes. The label is still the iconic black and white, minimalist look and it still highlights many of the same categories. While it may look very much the same, so much has changed. Let’s take a look at some of the major changes! The first difference is the refreshed design. The type size for “Calories”, “servings per container” and the “Serving Size” is increased while the numbers for Calories and Serving Size is now bolded. 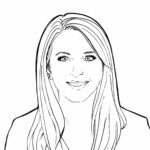 The goal is to allow consumers to more easily understand what they are consuming and not require a microscope to read it. The next big update is new category of “Total Sugar” with “Added Sugars” listed below. The goal is to allow consumers to tell the difference between naturally occurring sugars and sugars that are added during processing. The amount of added sugar will be expressed in both grams and as a percentage of the daily value. 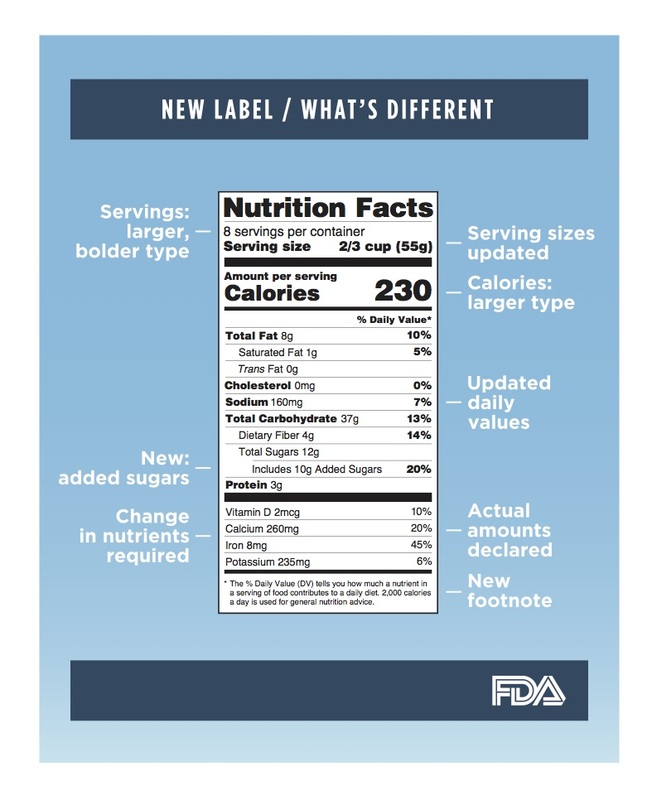 A third big change is the update to the serving sizes and labeling requirements for certain packaged goods. 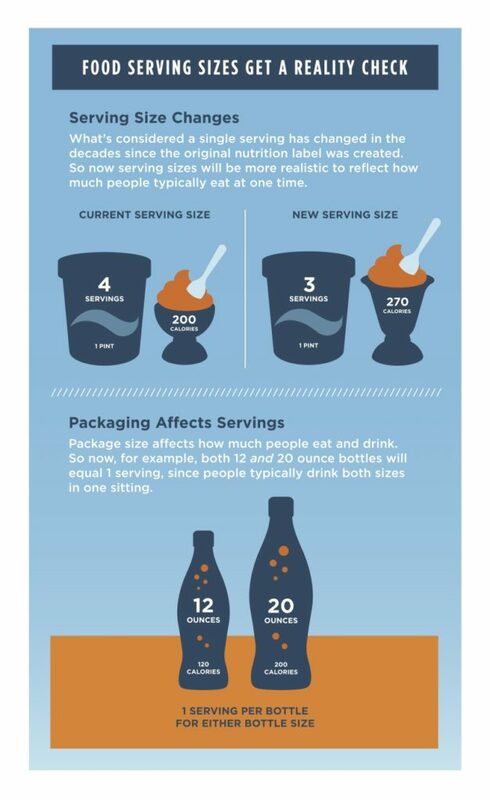 Now, serving sizes must be based on the amounts of food or beverages that the consumer is actually eating. One example of this is bottles of pop. Typically consumers drink the contents of the bottle so both 12oz and 20oz bottles will equal one serving on their nutrition facts label. 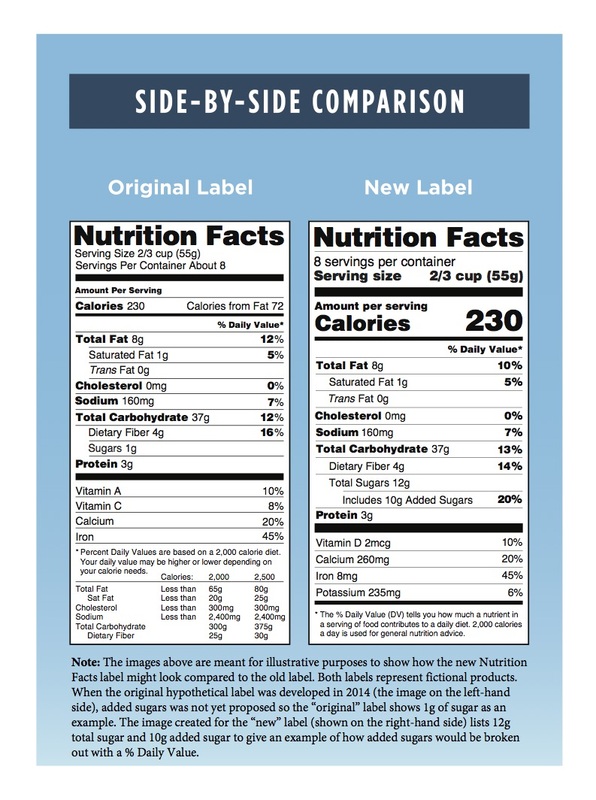 For certain products that can be consumed in multiple sitting or all at once, they will be required to have a dual column label to indicate the nutrients in a serving and in a package.